Enter your dates to pick from 94 hotels and other places to stay! Experience 5-star hospitality in Macao at Four Seasons Hotel Macao, Cotai Strip, just 5- minutes' drive from the 18-hole Caesars Golf Macau. Rooms and Service perfect. Marvellous complimentary cake and champagne provided on occasion of wife's birthday. Also hotel has Fox news channel which provides a welcome relief from the other mainstream fake news channels. 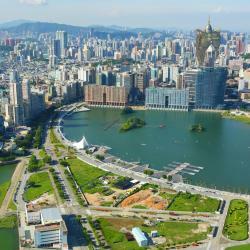 Galaxy Macau offers luxurious 5-star accommodations within the Galaxy Macau Resort, across Macau’s ‘Old Taipa Village’. It features the world’s largest Sky Wave Pool and offers free WiFi in rooms. There are no words to describe the experience there. An amazing hotel.Rooms and lobby, service, luxury, dining, pool area the hotel's stunning design. Just amazingly amazing! highly recommended! Set within Cotai’s Galaxy Macau™ integrated resort, The Ritz-Carlton, Macau is a hotel offering upscale experience for travelers. Both the staffs and the Management officers were very helpful, courteous, caring and informative. 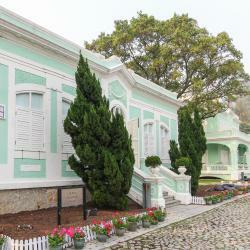 Located in the heart of Taipa, Altira Macau is conveniently within 1.2 mi to Taipa Houses Museum and the Orient Golf Club. We live just a few blocks from the property. We booked Altira to celebrate our boy’s birthday. The view, staff, pool, spa and everything is amazing as H. I can go on and on. We have travelled to places and stayed in numerous hotels locally and abroad, but Altira is exceptionally amazing. All their staff at the property are courteous 11 out of 10 ratings it is! Because of its layout and how they make their areas separated, the room floor feels so private and not crowded. This hotel does deserve its award as one of Forbes top Ten worlds luxury property. My 7yr old son loved everything about the hotel. My boy can be the youngest best critic when it comes to hotels. The twin beds are big and comfortable enough for two, plus an extra bed,my 3 kids hubby and I fit just fine. But the room is still spacious and did not look like a camping site. Nüwa is part of the City of Dreams in Macau's Cotai Strip, a large holiday complex with a casino and a large shopping arcade. Staffs were friendly and professionals, room was large, clean & modern with great view, spa was great and with good amenities, breakfast was really really great. It was only here that I had the best omelette. Their food was delicious. Part of the Galaxy Macau resort complex in Cotai City, the luxurious Banyan Tree Macau is the first high-rise urban resort in Macau. The room was big and it's very relaxing. 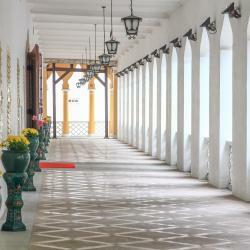 Mandarin Oriental Macau is located on the Peninsula, a 5-minute drive from A-Ma Temple and Senado Square. The hotel blew me away with service. We got upgraded to a better room at check in, and I was very surprised to have a "happy bated" cake waiting in the room in the evening. 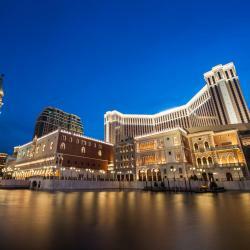 Centrally located in Cotai, Macau, The Parisian Macao features a luxurious shopping mall, an outdoor pool and water park. The room is facing to the effiel tower. It just looks amazing. The suite room is very big with all the necessary facilities. We love this hotel. 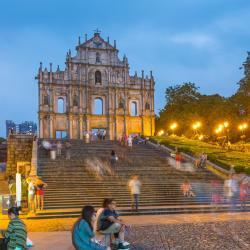 Boasting an indoor swimming pool and a fitness center overlooking the gorgeous coastal seascape with dramatic sea views, the 5-star Crowne Plaza Macau is only a 5-minute drive from Macau Ferry... The staff was really friendly and the room was amazing. Boasting a rich collection of dining options, Broadway Macau offers high class guest rooms, shopping mall and outdoor swimming pool. Free WiFi is available throughout the property. Friendly staff. Free shuttle bus to airport and ferry terminals. Very clean and comfortable. My room had a shower and a tub. Room service was fast. Good location. Offering an indoor heated pool and a spa and wellness center, Rio Hotel is located in Macau, a 10-minute walk from Hong Kong-Macau Ferry Terminal. We have a good night staying here. Hotel staff are very accommodating and informative especially the Filipino who assisted us. He is very knowledgeable. Plus, hotel provide a phone device that you can use outside the hotel for local call and text and most of all for internet connection.